Kidney stones are one of the most common and painful kidney disorders. About 10% of people will develop a kidney stone at some point in their lives. For many, stones become a chronic problem. People who get one stone are more likely to develop others. The kidneys, each about the size of a fist, are located in the lower back. They are connected to the bladder by narrow tubes called ureters. The kidneys act as filters for the bloodstream. They catch needed substances and return them to circulation. They also dispose of unneeded substances in urine. Urine collects in the bladder and then passes through another narrow tube called the urethra and before exiting the body. Kidney stones are formed when minerals and other substances build up in the kidneys. They become so concentrated that they crystallize into solid particles. Under normal circumstances, urine contains chemicals that keep this from happening. This action can fail under certain conditions. If the resulting crystallized particles remain small, they can pass through the urinary system without problems. 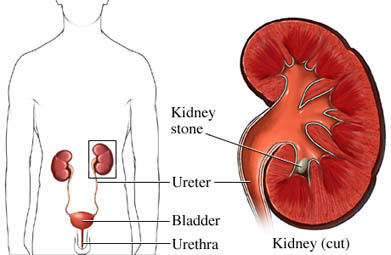 Larger stones, though, can become lodged in the kidney or further down the urinary tract. Calcium oxalate and calcium phosphate stones —These 2 types are the most common. They make up about 80% of cases. These kidney stones usually form when the concentration of calcium or other minerals in the urine becomes too high. Struvite stones —These stones are composed of ammonium, magnesium, and phosphate salts. These develop as the result of a urinary tract infection. Uric acid stones —These stones form when urine is acidic. They may also occur in people with gout or those having chemotherapy. Cystine stones —The result of a rare genetic disorder that causes the kidneys to build up excess amounts of cystine, one of the amino acids that make up proteins. What are the risk factors for kidney stones?What are the symptoms of kidney stones?How are kidney stones diagnosed?What are the treatments for kidney stones?Are there screening tests for kidney stones?How can I reduce my risk of kidney stones?What questions should I ask my doctor?Where can I get more information about kidney stones?